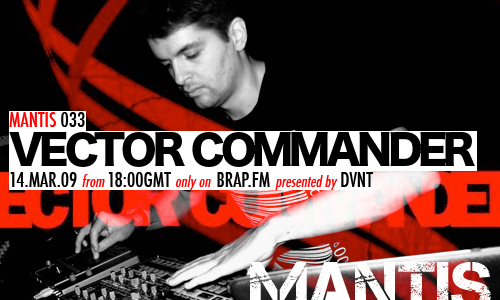 Spring is here, and on the Mantis Radio this week Brazilian techno talent Vector Commander with an artist showcase session. Bit of a change this week due to severe microphone problems there is no hosting. Yes yes I know, no DVNT screwing up the English language. Alex Strunz has always liked electronic music, ever since he first heard groups like New Order, Front 242 and Depeche Mode. The Vector Commander project begun in 2002 and takes influence from Front Line Assembly, A Split Second, Project Pitchfork, Nitzer Ebb, and Front 242 as well as several Techno DJs including: Speedy J, Chris Liebing, Sven Vath, Thomas P. Heckmann, Terence Fixmer, Christian Varella, Dave Clake, Adam Beyer, and Richie Hawtin. Halfway through 2005 the Vector Commander project was changed to incorporate new fusions and sonorities leaving behind the analogical sound, but keeping always, the dark dancing atmosphere. Towards the end of 2005, triggered by deep research into experiences, new equipment. New technology appeared in Alex’s LIVE PA with analogical lines but without any boundaries, but always with live intervention as a key factor. Thus was incorporated new effects and vocoders in the live situation creating a real Techno show. From then to now, his LIVE PA hasn’t stopped and he has been at a fair few parties, clubs and Techno raves having at his sides DJs like: Speedy J, Inigo Kennedy, Vince Watson, Dan Physics, and Ade Fenton. He has also been at Brazilian festivals and European Web radios in different countries.